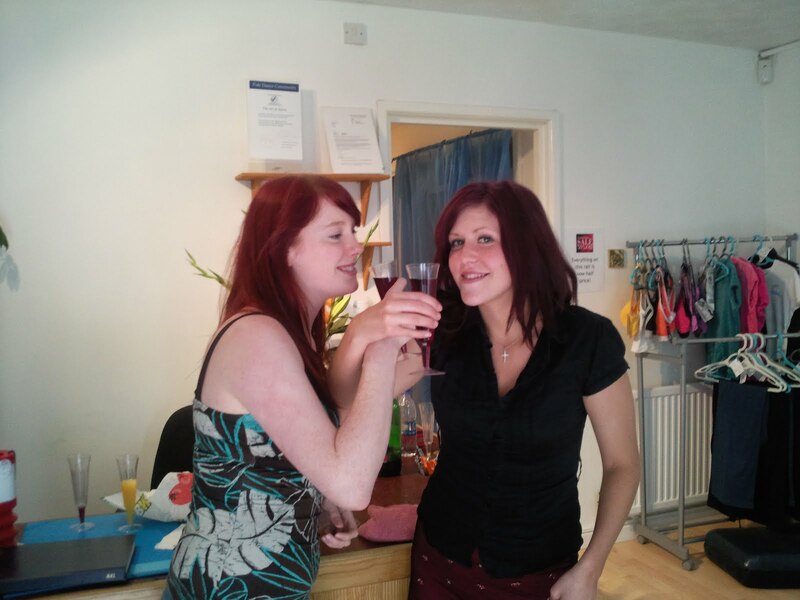 picture above of Emma Thorpe and UPPDC chair Lou Watts toasting the art of dance! What a fabulous day yesterday was! After much hard work behind the scenes the art of dance re-launch was an immense success. 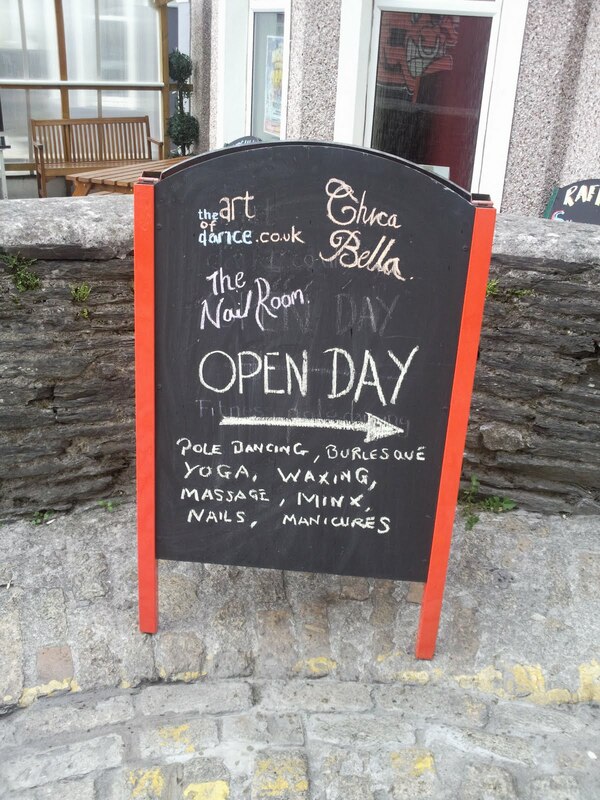 Beauty salon Chica Bella opened as planned last Tuesday and The Nail Room was ready for the open day and it's first day of trading which will be held on Tuesday 7th September. Pictured from left to right - Pole Dancing instructors Sam Remmer (that's me! ), Rosanna Durban, Pole Flow Yoga teacher Jane Macdermott, Burlesque Goddesses Georgina Gale and Amelia B, Creative Nail Technician Naomi Grant and Beauty Expert Lisa Hill. The day started with some last minute dashes to buy flowers, pour the bubbly, vacuum the studio and polish the studio mirrors ready for the arrival of members of the public at 1pm. It was so lovely to see the art of dance building busy with it's new staff team, existing students and new faces eager to see the refurbishment. Just before 2pm the lovely Lucy, a photographer from the Herald, dropped by to snap some pics. I stupidly sugested that it would be good for Rosanna and I to do an extended butterfly on each side of the pole with me at the top, I didn't realise quite how long we would have to hold the pose and I, for one, was glad to return safely to the floor after the pics were taken. Can't wait to see the results. Check out the sandwich board above which took me some time to write as the words pole dancing, massage and minx next to each other just looked really dodgy! 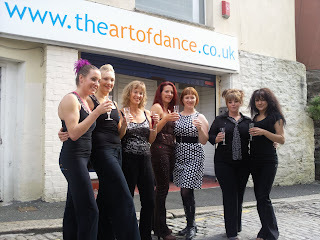 As the day went on more people descended on the art of dance studios and a few ladies started to feel the effects of the bubbly and their frequent visits to Raffles bar next door. 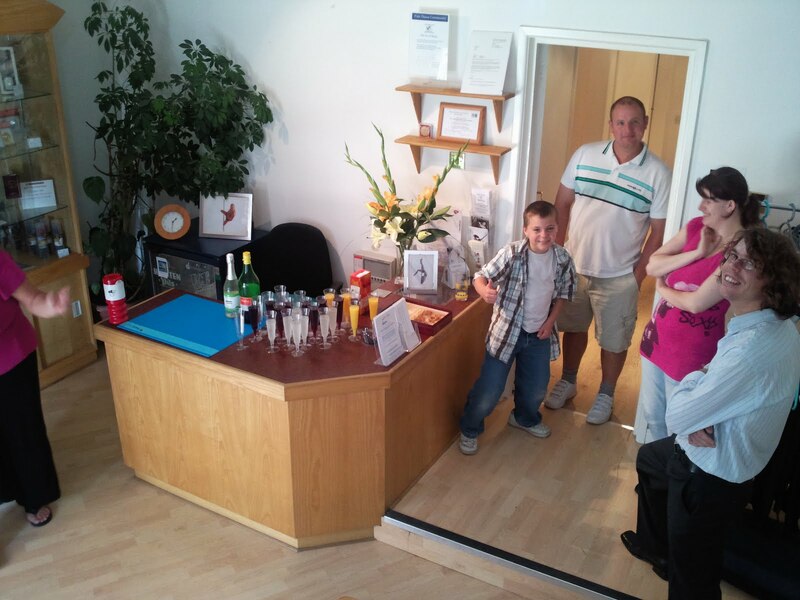 Lisa, Naomi and I were buzzing as we all took extra bookings as a result of the open day. A huge thank you to My Mum and Carol Milligan for all their help that ensured the refurbishment was finished on time. Another massive thank you to my lovely husband for all hos hard work in putting together the template for my new website as well as time involved fixing all the errors I then made on the template! I must add that we missed Tamar terribly as she had to work elsewhere but I am looking forward to telling her all about it on Monday . I also want to say how pleased I am to be working with Lisa, Naomi and Jane, it is going be so great to work with such wonderful ladies as well as working with my brilliant existing staff team. I feel very lucky to be working with such a lovely bunch of people. The Open day soon descended into chaos as we hit the Fortescue, cracked open more bubbly and generally behaved in a raucous manner for the remainder of the evening. Apologies to the Fortescue regulars for the immense laughter and the drunken toasts that took place! More pics from the open day and after-party to follow very soon! Before I sign off for the day I wanted to share some news from the King of Plymouth event organised by PCSO Pablo Beckhurst, the event took place next door to the art of dance yesterday and saw about 300 people descend on the church for the break-dancing competition which was eventually won by Paris based Marcio from Legiteam Obstruxion. Full results as follows and check out the video below for the fantastic final dance-off.